I’ve been to the theatre twice in the last few days – once to the King’s Head in London to see Queers, six monologues about LGBT life, and also to the Oxford Playhouse to see Sunset Boulevard, a perhaps better known show all about an ageing film star who goes off the rails. Both were brilliant productions but for completely different reasons. With Queers, young playwright Pat Cash has created six memorable LGBT characters who offer us brief and poignant glimpses into their lives. With Larry the Laydeez’ Lothario we witness how lad culture can suppress people’s sexualities out of fear and prejudice. In Queen Marsha F Star Star King Fabulous of Dalston we witness the fight for trans people to exist when she’s very bluntly told that she is not a woman. Each monologue was around ten minutes yet they all managed to pack a tear-jerking emotional punch. The most moving for me was the story of Old Tom who is sat at a gay bar in Soho recounting his younger days of activism to a bored, young bartender. Matthew Hodson’s portrayal of Tom is poetic and understated and he also puts on a great voice for the barman. Tom’s life is a lonely one as so many of his friends have died but as his story concludes the bartender, no longer checking his phone, puts his hand on Tom’s and calls him a friend. This simple idea that loneliness does not have to last forever is extremely touching. 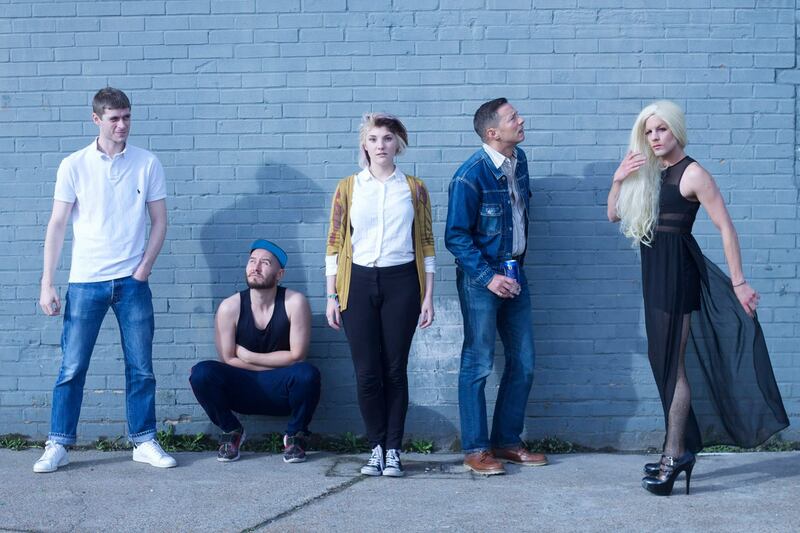 At £12 Queers is a bargain, on until 22nd November. Now over to Sunset Boulevard – an exciting and exceptionally professional production from the self-professed “amateur” Oxford Operatic Society. A giant cast made for hectic and well-choreographed chorus moments and two strong leads meant the story of Norma and Joe played out with suitably dramatic highs and lows – Norma is a fascinating character as her addiction to her faded fame and external validation renders her a vulnerable and exceptionally fragile person whilst Joe’s desire to succeed often turns him into a selfish bully who, for some reason, women keep falling for. The show captures the fickle nature of showbiz and cast rivalries very astutely which couldn’t help but make me question the nature of the relationships of the actual cast members! Add to this a great spiral staircase, Norma’s epic wardrobe and a full-sized orchestra blasting out their melodies from the pit and you’re in for a good time. Two shows left today, go, go, go! Yet as I watched Sunset Boulevard something jarred – something about the joke about not taking black friends to restaurants (apparently that’s a big no-no in 1950s screenplays) sung by a predominantly white cast, something about the token camp character (who we were encouraged to assume was homosexual) who was played for laughs, something also about the desperately stereotypical roles the leads took – past-it, fifty year old woman who goes mad and driven, sometimes selfish, young guy who ultimately gets shot in the back. I know that musicals don’t have to be informed by feminism or be diverse but I think it’s fun when they are. One could certainly interpret Sunset Boulevard through a feminist-Marxist lens and appreciate that the highly competitive and capitalistic world of film-making basically treats people very badly (apart from maybe the directors and producers) and makes us all into monsters but to do this one might also have to clutch at a few straws. It’s also somewhat of a bitter pill that whilst older, female actors are still being discriminated against in the various acting industries one of the major lead roles for an older woman in a musical is that of a faded, mad ex-actor! This is where Queers has the edge because it’s unapologetically diverse and not necessarily because it’s trying to make a point about diversity but simply because it couldn’t but be. To meet the characters of Queers is to meet a brilliant panoply of different people whilst treading the boards of Sunset Boulevard seems to be a somewhat white and stereotyped experience. Normalising diversity in films, theatre, TV and musicals isn’t just a question of casting diverse people it also means writing inherently diverse scripts. So, I reckon that Sunset Boulevard (whilst a brilliant production) is a bit like Norma Desmond, stuck in the past, whilst Queers is ushering in a very different sort of sunrise.